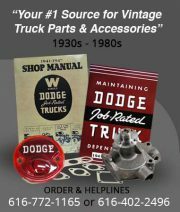 The truck is a 1946 FLS60s 2.5 ton Fargo. Owner Rick Campbell was after the truck for almost 10 years, trying to buy it off the owner, when he finely got it there wasn’t much left of it. Check out this walk around video by DCM Classic customer, Monty Allen, of his 1949 Fargo 4BT. Great look at an installed I-155 ABS Headliner.